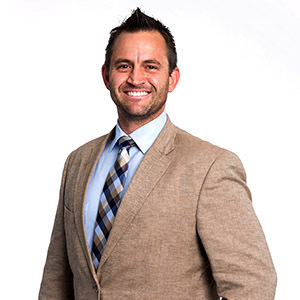 Originally from Orem, Utah, Dr. Caleb Pinegar is a specialist in the evaluation and treatment of athletic injuries and degenerative conditions of the shoulder, knee, and elbow. He brings to the Crovetti team and the Las Vegas community his extensive experience and training, and a passion for his profession. His medical school training was at Des Moines University, from which he continued on to a 5-year residency in Orthopaedic Surgery in Cuyahoga Falls, Ohio. Just prior to joining Crovetti Ortho, he completed an Orthopaedic Sports Medicine Fellowship at the internationally recognized Andrews Research & Education Foundation in Gulf Breeze, Florida. This allowed him the honor of working one-on-one with renowned orthopaedic surgeon, James R. Andrews, MD – considered to be one of the fathers of sports medicine. Dr. Pinegar first developed an interest in sports medicine following his own injuries as a young soccer player. As a result, his Fellowship work with Dr. Andrews – which included participating in the AOSSM-initiated S.T.O.P. (Stop Trauma and Overuse Prevention) program – dovetailed perfectly with his desire to remain heavily engaged with kids, parents, coaches, and teams in promoting an awareness of the prevention and proper treatment of sports injuries. Pursuing his dream of working in sports medicine from a young age, he majored in athletic training and completed internships with the volleyball, gymnastics, track & field, and football teams at Brigham Young University. Just prior to BYU, he spent two years teaching and providing service in Kyiv, Ukraine for The Church of Jesus Christ of Latter-day Saints. Dr. Pinegar’s hobbies include mountain biking, triathlons, rock climbing, golf, boating, and snow skiing. He enjoys spending his free time with his wife, Annie, and their three children – whose athletic ambitions always keep him on the edge of his seat.